Mike Aguirre and Kristine Go outside MK Apothecary in Collingswood. Credit: Matt Skoufalos. 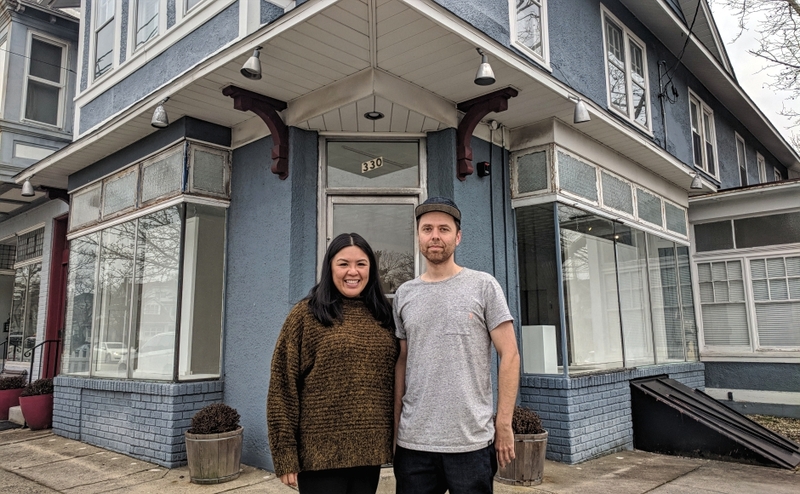 Designer Kristine Go and oil painter Mike Aguirre will open MK Apothecary, their artist workspace on Haddon Avenue, this spring. MK Apothecary founders Mike Aguirre and Kristine Go. Credit: Matt Skoufalos. 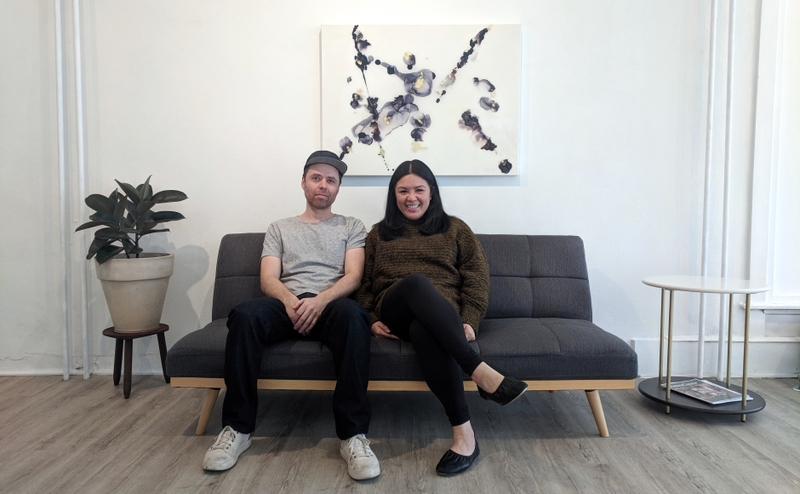 Artists Mike Aguirre and Kristine Go had always dreamed of owning a gallery that would also function as a live-in work space. But in 23 years together, their careers offered little opportunity for settling down permanently. The couple, who met at the Academy of Art San Francisco, estimates that they’ve moved about every two years on average, having lived in 10 U.S. states. Go is a textile designer and fashion consultant; Aguirre is a fine artist who specializes in oil paintings. In all their travels, Go, a New Jersey native, estimates they’ve spent more time in Philadelphia than anywhere else. 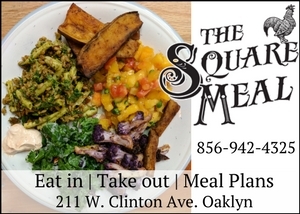 So when they started looking for a more permanent base of operations, they scouted properties in Northern Liberties and Fishtown as well as across the Delaware in Merchantville and Oaklyn. 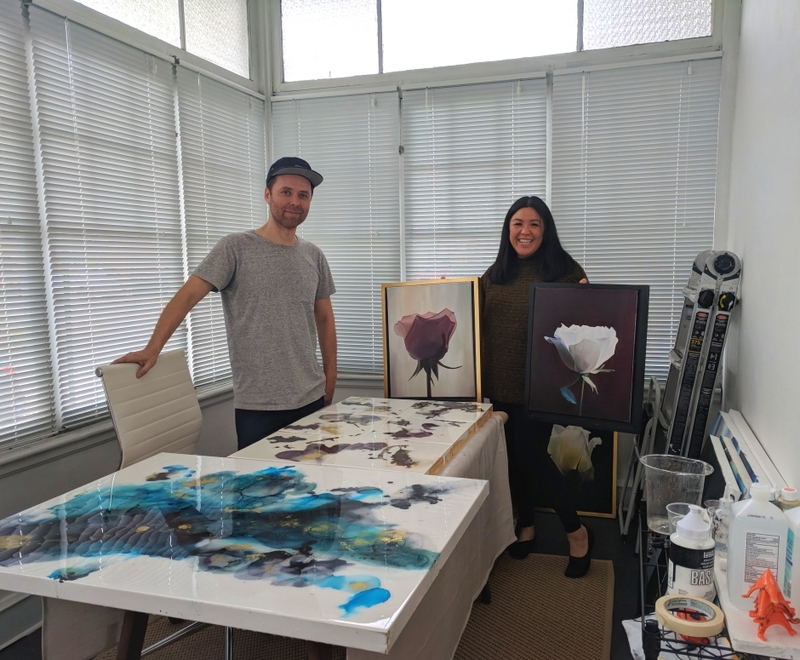 Mike Aguirre and Kristine Go in their studio space. Credit: Matt Skoufalos. “We love the city but as we get older, we don’t want to be in it,” Go said. 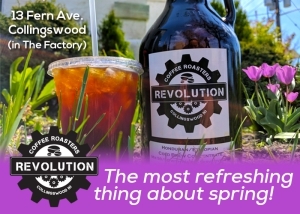 “When we came back [to Collingswood], Sabrina’s had opened up, Occasionette opened up,” she said. 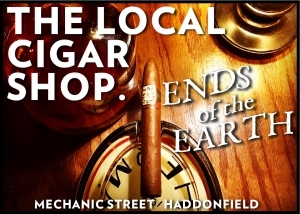 In 2016, they finally settled on the former Haddon Pharmacy at 330 Haddon Avenue in Collingswood—and shortly after closing, moved to Wisconsin for work. Almost three years and a lot of hard work later, they’re ready to open the doors of their combined studio and gallery space, MK Apothecary. 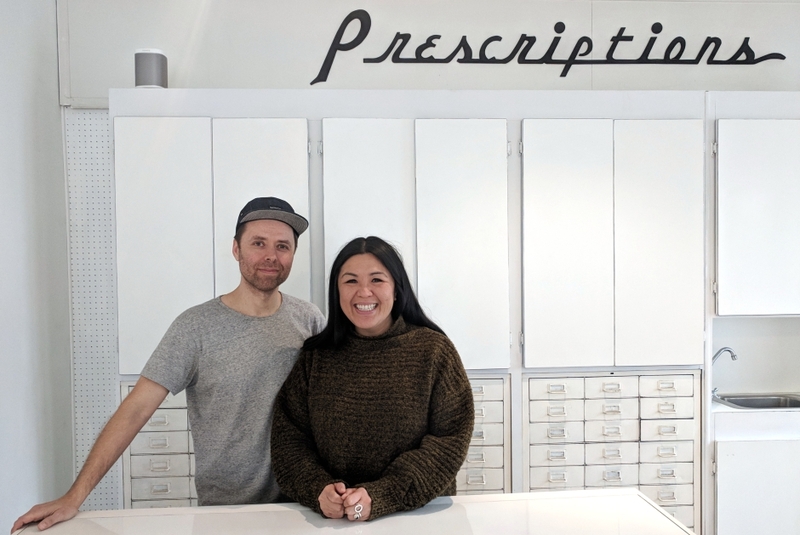 Inside the historic former pharmacy, Aguirre and Go have repurposed its prescription counter, restored its classic wooden signs, and salvaged some antique building components for future use. A handful of succulents frames a window overlooking the sun porch that serves as a studio space; inside the main area, a black, mid-century couch and a table and chairs serve as the only furniture. The building, like their intention for it, is essentially a blank slate. Go describes it as a gallery and event space as well as a center for future art classes. 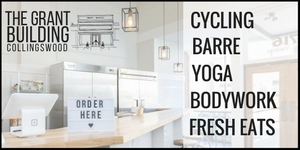 A certified Baptiste yoga teacher, she expects to host community yoga there. But those notions represent only a handful of potential activities the Apothecary could facilitate. Mike Aguirre and Kristine Go at the prescription counter of the former Haddon Pharmacy. Credit: Matt Skoufalos. “It’s available to anybody,” Go said. 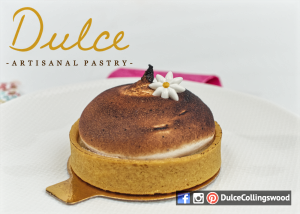 “We want to be of service to the community and still uphold our artistic values and be creative. “As artists, we tend to be very siloed,” she said; “freelancers don’t have a community. Aguirre said he’d like the space to be a collaborative environment in which other artists can exchange ideas and work alongside one another. For art enthusiasts who don’t want to commit to an entire series of classes, the couple envisions offering one-offs or drop-ins. 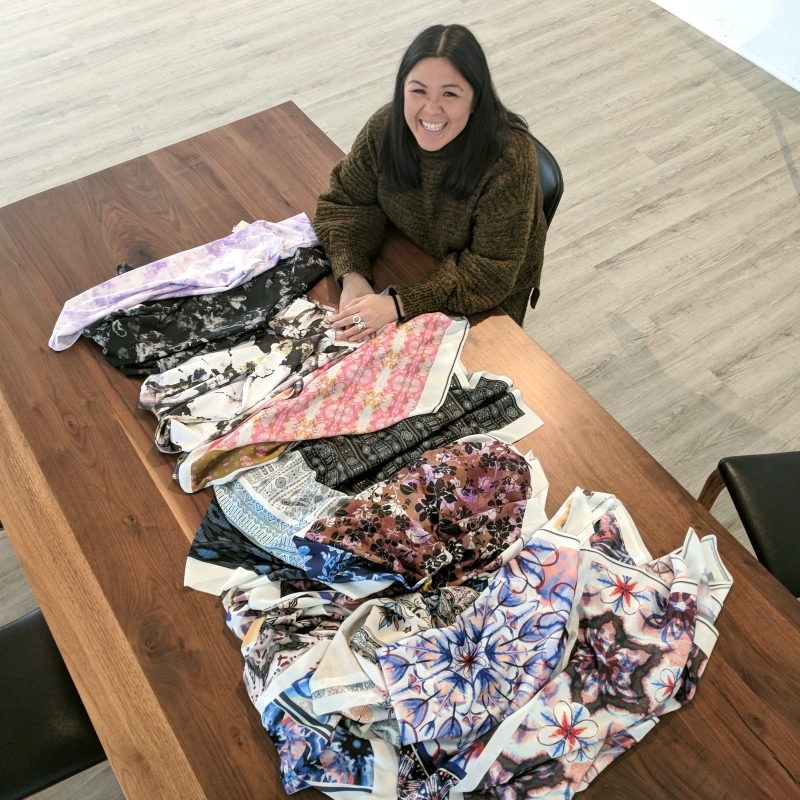 Kristine Go designs patterns for the fashion industry. Credit: Matt Skoufalos. “Every place we’ve lived, we’ve always been a part of the community, and really good about keeping in touch with people,” Go said. 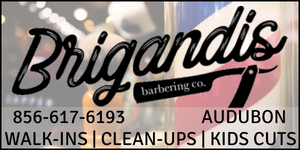 By opening in a suburban setting, Go and Aguirre also want MK Apothecary to be accessible to the general public. They welcome visitors, whether browsing the current exhibit or just for a chat. “I think sometimes there’s a stigma around an art gallery or studio, that it’s snooty or stuffy,” Go said. “Museums are great,” Aguirre said; “I could pop into galleries every day. But it’s a day-long event of having to look through everything. “I like the idea of being able to look somewhere, see some new art, and see what it’s all about,” he said. MK Apothecary hasn’t settled on an opening date yet; hours are likely to be 10 a.m. to 6 p.m., and extended for workshops or appointments. 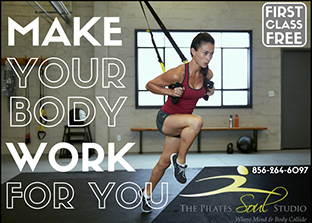 Visit its website for details.